In August 2013, a salvage excavation was conducted at the es-Sawafir el-Gharbiya site, west of Merkaz Shapira (Permit No. A-6890; map ref. 17200–6/62290–7) in the wake of damage that was caused to antiquities by mechanical equipment. The excavation, undertaken on behalf of the Israel Antiquities Authority and financed by the Israel Electric Company, was directed by A. Fraiberg, with the assistance of Y. Al-‘Amor (administration), M. Kunin (surveying and drafting), D. Varga (scientific guidance) and N. Zak (plan). 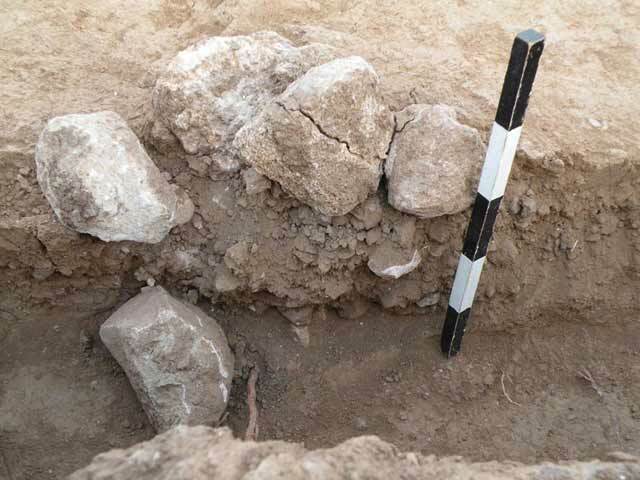 One excavation square was opened on the western bank of Nahal Deganim, and a wall foundation (W10; Figs. 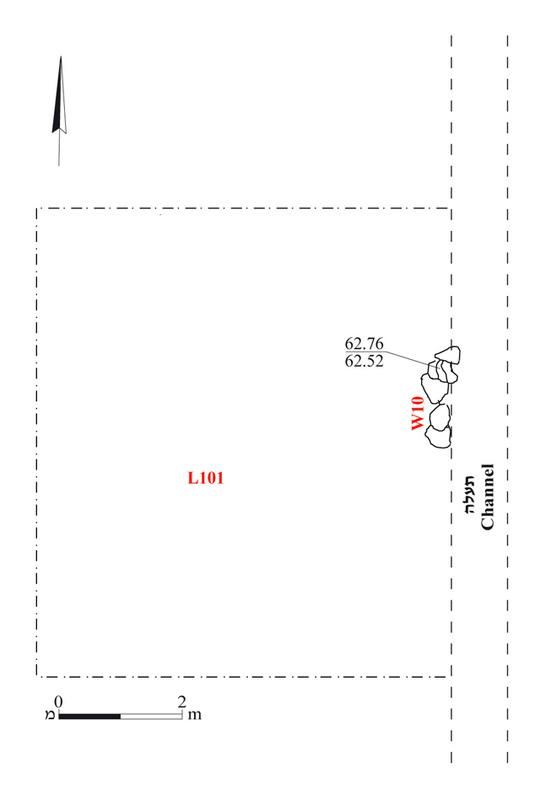 1, 2) aligned in a north–south direction was discovered. The foundation was built of small fieldstones (0.10 × 0.15 × 0.20 m) set on loess and was preserved to a maximum height of two courses (c. 0.24 m). Pottery sherds dating to the Byzantine period (fifth–sixth centuries CE) and consisting mainly of body fragments of Gaza jars were found in soil fill (L101) adjacent to the western side of W10. The sherds date the wall to the Byzantine period. Varga D. 2009. Es-Sawafir esh-Sharqiya (Shapira Center). HA-ESI 121.